CMP ENGAGEMENT of Contract Notification dt 03.10.2018 (Hindi) . EXPRESSION OF INTEREST (EOI) FOR HOSPITAL VISITING SPECIALIST AT RAILWAY HOSPITAL. 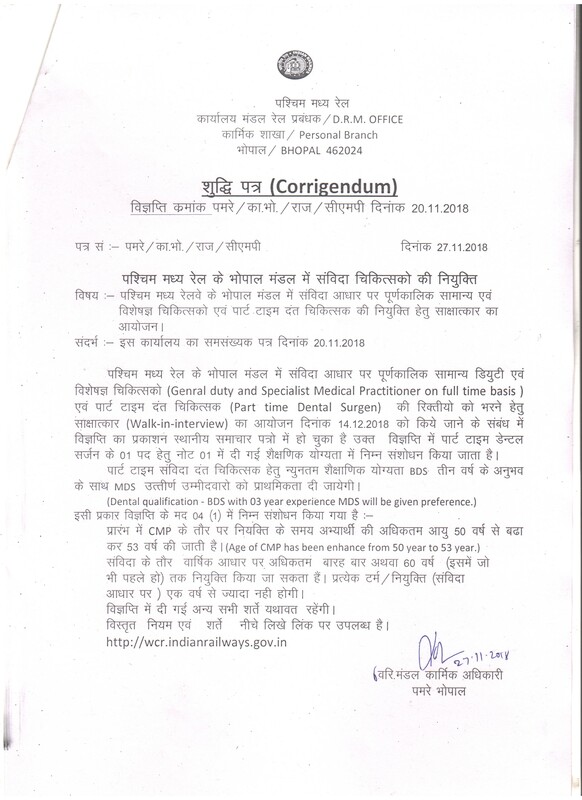 "Engagement of contract medical practitioners in Hospitals of West Central Railways in continuation of Notification No. Gaz/Medical/2-2015 - interview date 02.07.2018 at Jabalpur"
"Engagement of contract medical practitioners in Hospitals of West Central Railways in continuation of Notification No. Gaz/Medical/2-2015 - interview date 04.04.2018 at Jabalpur"
"Engagement of contract medical practitioners in Hospitals of West Central Railway in continuation of Notification No Gaz/Medical/2-2015-interview date 07.03.2018 at Jabalpur"
Expression of Interest from Private Hospitals for Emergency. Expression of Interest from Pathology Investigation Laboratory for providing diagnostic test at CGHS rates for the sub - Divisional Railway Hospital at Bina, for a period of 02 years. Expression of Interest from stand alone Centers/Hospitals for providing Dialysis Treatment to patients of Divisional Railway Hospital/Bhopal/WCRly for a period of 02 years. "Engagement of contract practitioners in Hospitals of West Central Railway in continuation of Notification No.Gaz/Medical/2-2015-interview date 06.11.2017 at Jabalpur"
Engagement of contract medical practitioners in Hospitals of West Central Railway in continuation of Notification No Gaz/Medical 2/2015 - interview date 05.06.2017 at Jabalpur"
Empanelled of all CGHS/ECHS and ESI hospitals for Jabalpur.